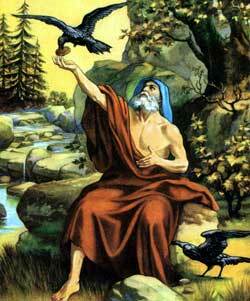 God feeds Elijah by sending a raven to bring him food. ERY SOON AFTER the separation of the twelve tribes the kingdom of Israel fell into idolatry. Jeroboam, its first king, set up golden calves in Dan and Bethel, the two extremities of his dominions, to prevent his people going up to Jerusalem (which belonged to the kingdom of Judah) to worship God. But, though they worshiped these images, they had not entirely rejected the true God. It was under Ahab, the sixth king, a weak and wicked man, whose wife, Jezebel, was even worse than himself, that the worship of the true God was put down, and that of Baal established in its place. God was angry both with Ahab and his people for their idolatry and persecution of his priests, who were put to death in great numbers; and, as a punishment for these sins, He sent Elijah to tell Ahab that for three years and a half neither dew nor rain should fall in the land of Israel. As soon as Elijah had foretold this great evil, God bade him hide himself from the rage of Ahab in a certain place near the brook Cherith, where He had commanded the ravens to feed him. So he went and dwelt by the brook, which afforded him water to drink, while the ravens, as God had said, brought him food morning and evening. But, as no rain had fallen, in time the brook dried up, and then God bade him leave his present hiding-place, and go to Zarephath, near Sidon; for He had commanded a widow, who lived there, to provide for him. Elijah immediately went to Zarephath; and when he came to the gate of the city, he saw the woman gathering sticks. He called her, and asked her to give him some water to drink; and as she was going for it, he begged her also to bring him a morsel of bread. The poor woman turned round, and told him she had no bread. All that she had was a handful of meal in a barrel, and a little oil in a bottle, and she had just been gathering wood to cook it for herself and her son; after they had eaten it, they must lie down to die, for she knew not where to get more. Elijah bade her do as she had said, but to make him a little cake first, and afterward for herself; for God, he assured her, would cause her meal and oil to last till the famine should be at an end. So the woman made him the little cake first; and he, and she, with her family, were fed out of the handful meal and vessel of oil for many days. Neither of them failed till the day when God sent rain upon the earth, and so took away the famine.